A few weeks ago when we were taking down the decorations from the Christmas tree, I had a brilliant idea: I’m going to use the remains of the tree to dye some wool. 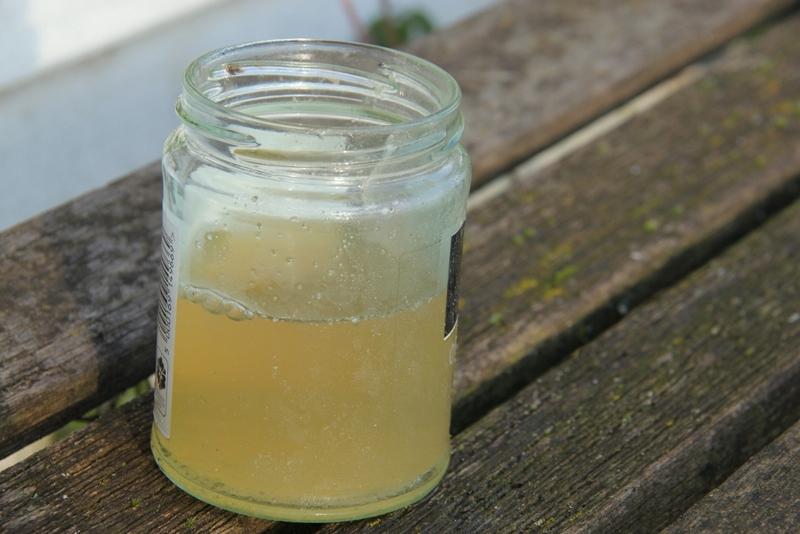 After all, I had dyed with fir in Finland over twenty years ago when I first experimented with natural dyes. I can’t remember any more what the basic colour was (possibly olive green? ), but I seem to remember that with iron you get a nice dark grey. Because of the different climate, conifers are not nearly as common here in the UK as they are in Finland. Here in Kent you only really see them if someone has planted one in their garden, so getting hold of fir for dyeing is not that easy. Now I realise the species of fir they sell as a Christmas tree here (typically Nordman fir) is not the same as the common fir tree in Finland (which is Picea abies), but I though it’s nevertheless worth having a go. Not very hopeful, is it? Given that there’s hardly any colour there, I think I will abandon this experiment and not even try to dye with it. So instead of showing you some beautifully dyed yarn, I’m going to have to find something else to show you today. And this one sort of fits with the green theme. It’s a table runner that I sewed for my sister-in-law for her Christmas present. I made two of them so that you can use them instead of table mats. 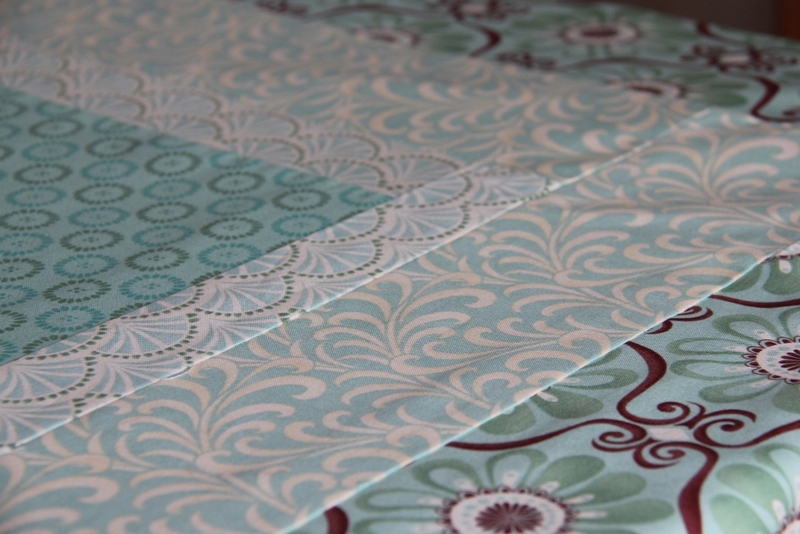 The inspiration for these table cloths came from my sister-in-law herself as she had sewn a similar set for me a few years ago. The material she chose was a great Marimekko classic, Tantsu (a similar fabric also goes by the name of Satula). I just love its strong and vibrant colours. Categories: Dyeing, Fabrics, Sewing, Tablecloths | Tags: dyeing with Nordman fir, natural dyeing, sewing, table runner, tablecloth, Tantsu fabric by Marimekko | Permalink. 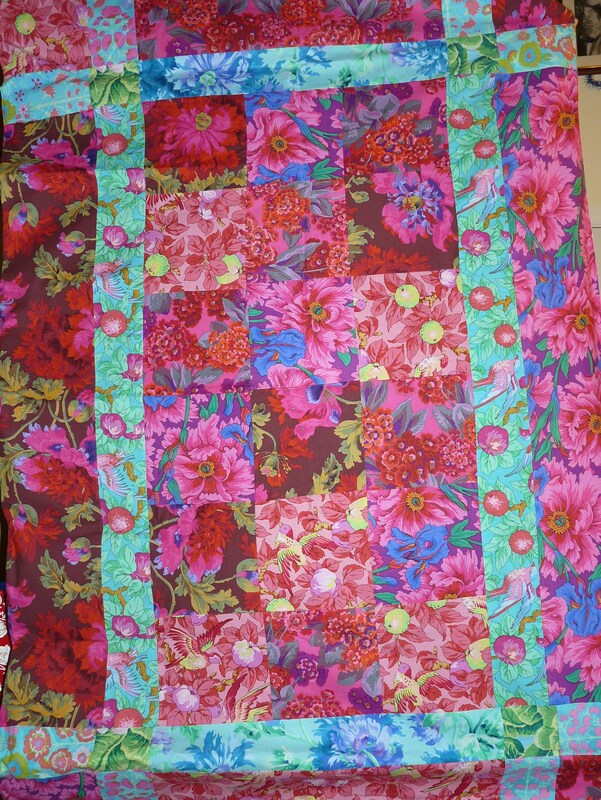 Here’s one of the Christmas presents I made – a patchwork tablecloth for one of my sisters-in-law. I like making presents for my sisters-in-law – as they are women pretty close to my own age it is always relatively uncomplicated to think of what to give them. Most of the time they’ll like what I like, which makes gift-making much less anxiety-inducing. 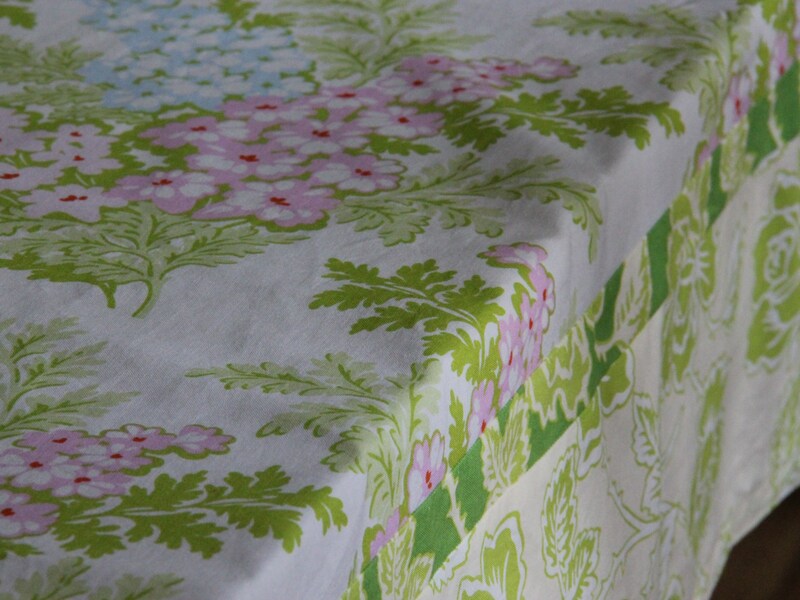 Home-made tablecloths from pretty fabrics always seem to be a big hit. The fabrics for this project are by Kate Spain. I particularly like them (well, they’re seagreen so what do you expect!) but I also knew they’d be just right for my sister-in-law’s dining room. I still have some fabrics left so I might need to make another one for myself. 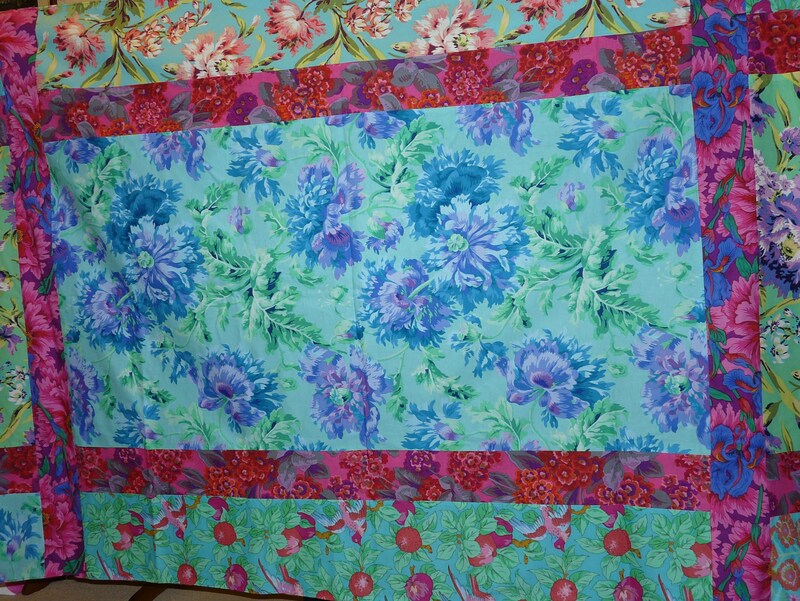 I nearly always make my patchwork tablecloths double-sided. Yes it takes more fabric and more effort, but the reverse side of patchwork never looks very tidy so I prefer to hide it between two layers. 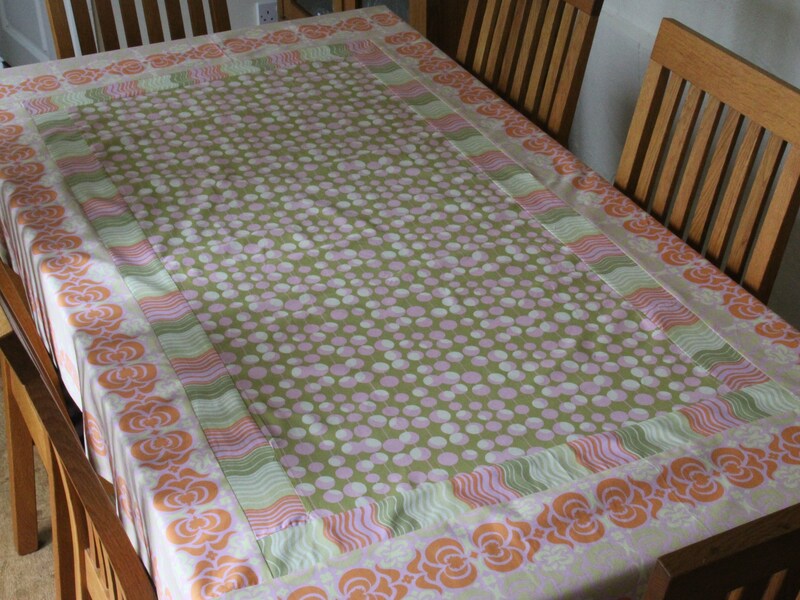 I’ve also found double-sided tablecloths to be very practical: if one side gets stained you just turn it over and you get a clean cloth without having to do any more ironing (great if you suddenly get an urgent need to keep up appearances because of unexpected guests). Categories: Fabrics, Sewing, Tablecloths | Tags: fabrics, Kate Spain, patchwork, sewing, tablecloth | Permalink. In addition to making great progress with my learning-to-knit-lace project (more of which in another post), I felt like doing a bit of sewing this week, just to do something easy and uncomplicated, and for the instant gratification of quick results. 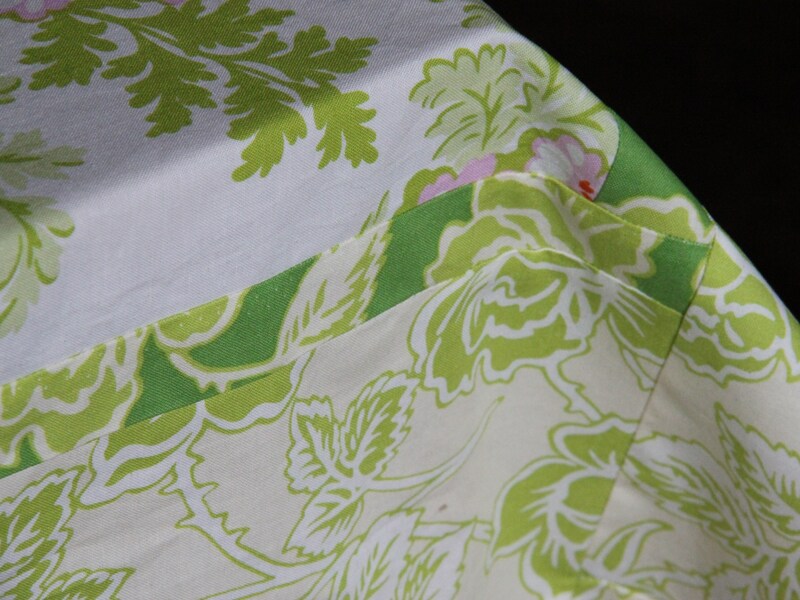 You might remember I made a tablecloth for my mum a few weeks back, and I felt like sewing a similar one just for me. 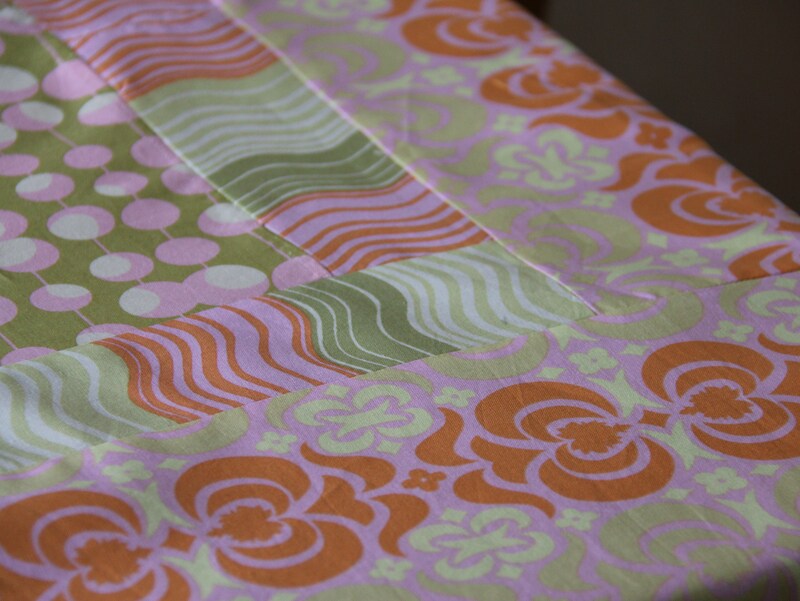 I had a great time playing with fabrics in my stash, and eventually chose some of my favourite Amy Butler fabrics, in orange, pink and green. I just love the colour combinations and the patterns (you will have gathered by now that despite my Scandinavian background I don’t really do stylish minimalism). 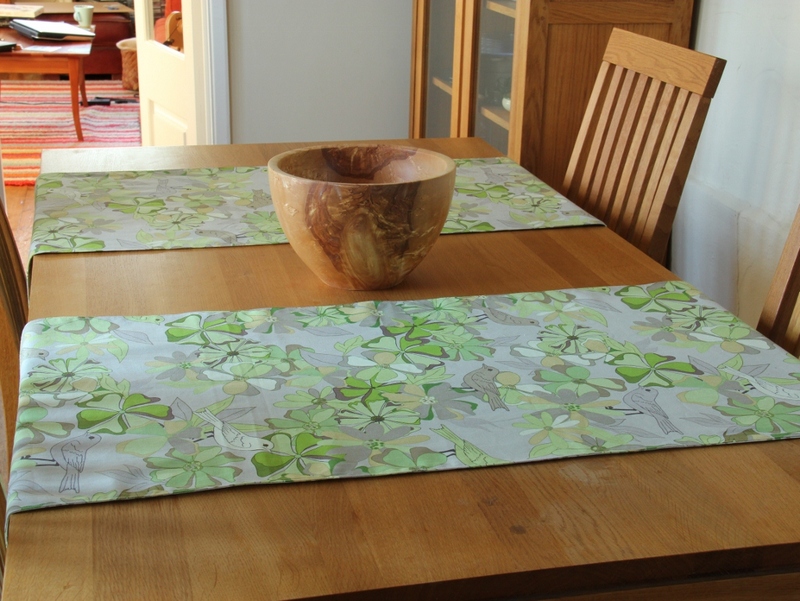 I’m really pleased with the results, the tablecloth suits the dining room really well. The combination of pink and orange gives the room – which is otherwise quite neutral – a lovely glow. So all in all, instant gratification was received! Categories: Sewing, Tablecloths | Tags: Amy Butler fabrics, patchwork tablecloth, sewing | Permalink. My mum had her birthday in June, and she asked if I could sew a tablecloth for her as a birthday present. As it is the height of summer, I wanted to select some really summery fabrics for the project. She lives in a modern flat, with walls painted white in a typical Finnish style, so modern cotton prints with large patterns suit the decor very well. In the end I chose some fabrics from Heather Bailey, as they are nice and summery, and romantic to suit my mum’s style but modern at the same time. 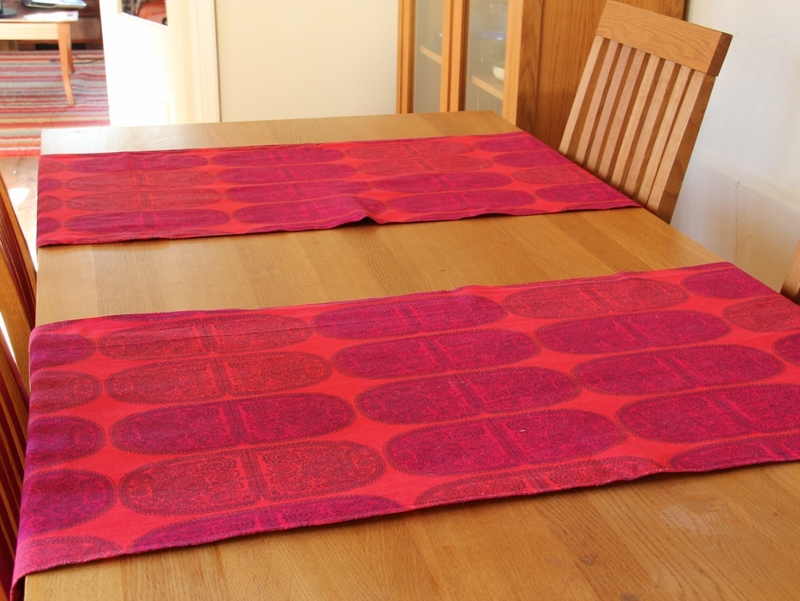 My mum and dad’s dining table is quite wide, so none of the fabrics were wide enough by themselves, so it had to be some sort of patchwork style, but I didn’t want it to be too overpoweringly hotch-potch. In the end I just added a border to the main fabric, with a narrow band of green fabric for contrast to separate the two main fabrics. I’m really pleased with the results, and I think my mum was too. Categories: Fabrics, Tablecloths | Tags: crafts, Heather Bailey fabrics, patchwork tablecloth, sewing | Permalink. 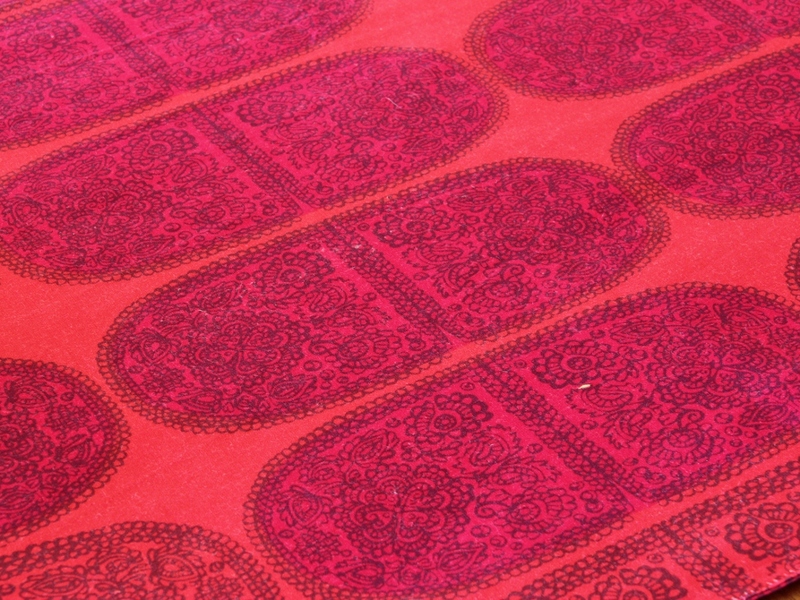 Yesterday I blogged about my not so successful attempt at buying Japanese fabrics. I eventually decided it’s probably best if I try to order some directly from Japan. The first online shop I came across in Google was Fabric Tales. Although their website is hard to navigate, their selection was very good (although more recently they seem to have had less stock). I wanted some fairly traditional Japanese fabrics , but unfortunately I had to stay away from the beautiful Kimono fabrics. They were dry-clean only and I wanted my fabrics to be easily washable as I wanted to make various types of household items from them. 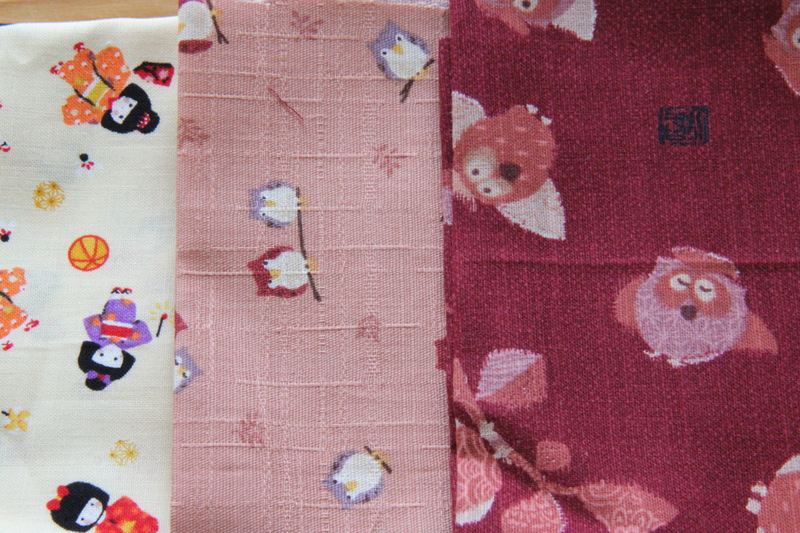 In addition to the more traditional Japanese prints, Fabric Tales also had a nice selection of very cute children’s fabrics which the Japanese seem to do particularly well (I particularly like these owl prints). Japanese fabrics seem to fall into two broad categories. The first group consists of flamboyant prints typically featuring flowers in lovely bright colours (I’ll blog about these in a few days time) and the second group has more simple patterns, often in red, navy, gray or autumnal shades. There are matching cotton solids which have a particularly nice texture to them (as in the olive fabric in the picture above). This second group of fabrics, in their simplicity, appeal to the Scandinavian in me and I think they particularly suit Finnish homes. 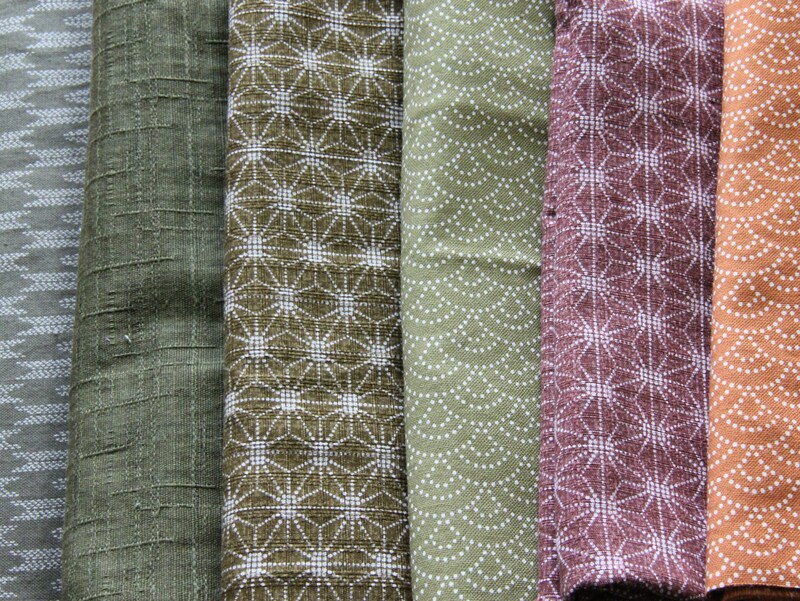 Those people familiar with sashiko embroidery will recognise some of thetraditional Japanese patterns shown on the left. 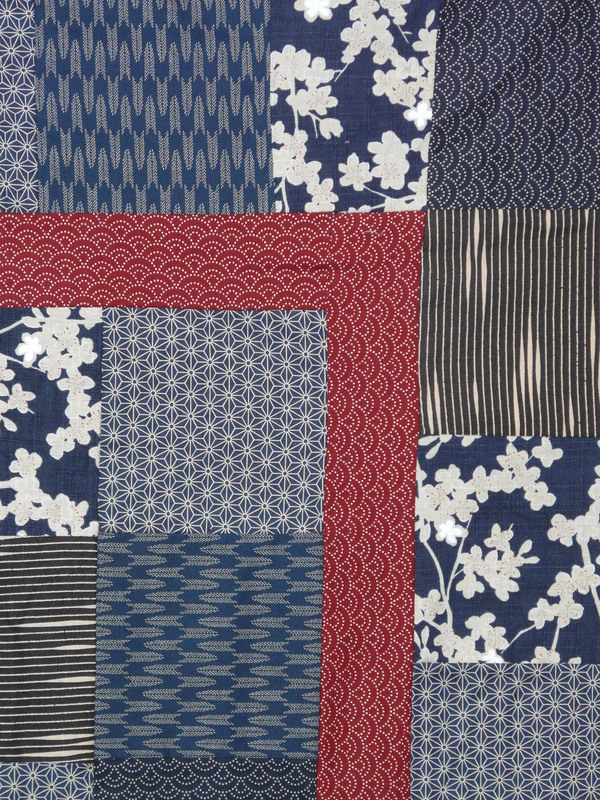 I’m by no means an expert in Japanese culture, but there is an interesting historical background to these fabrics (as well as sashiko embroidery). Apparently there used to be a law in Japan a few hundred years ago that forbade lower class people from wearing clothing made from elaborate colourful prints. As a result this law gave rise to navy linen clothing that was decorated with simple white embroidery. And later this must have lead to the same patterns being used in cotton prints. And apparently this law was also responsible for the multi-layered look of traditional Japanese costumes: the simple prints would be shown on the top, hiding the more colourful prints that were worn unerneath. Because these fabrics are not frilly and romantic, they are particularly good for making things for men. I used the navy and red fabrics to make a fleece-backed throw for my dad as a Christmas present last year. 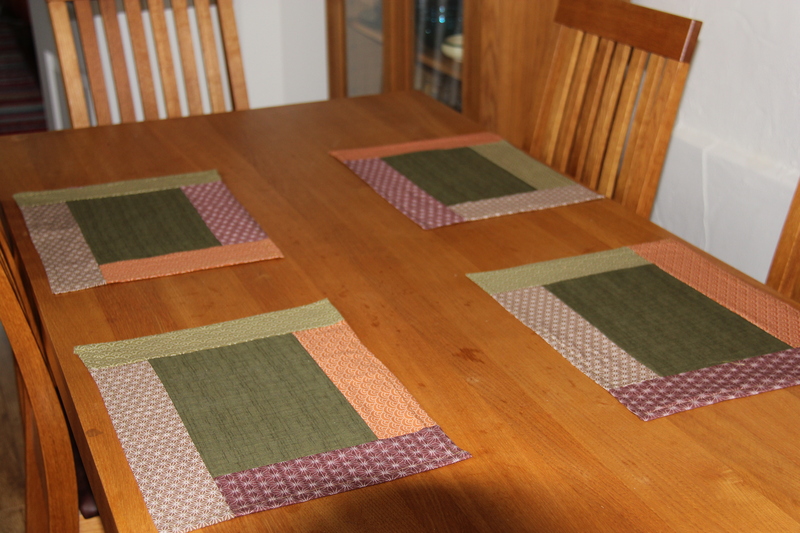 For my brother and sister-in-law I used the autumnal shades to make table mats. 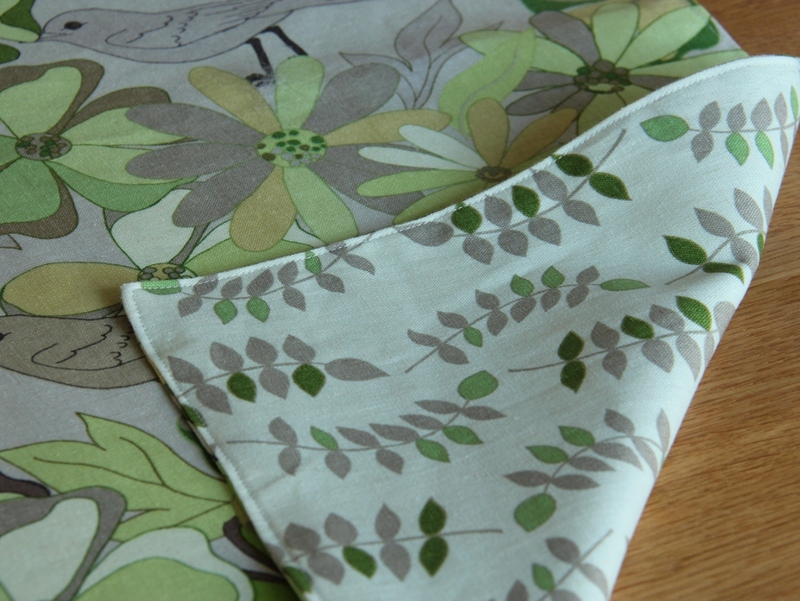 Their taste is very Scandinavian, and the understated beauty of these fabrics suit their home very well. Categories: Fabrics, Quilting, Tablecloths | Permalink. The weather here in Kent has been absolutely gorgeous all week. The spring really is in full swing, finally. As you can’t take sunshine for granted in this country, you must enjoy it as much as you can when it actually happens. 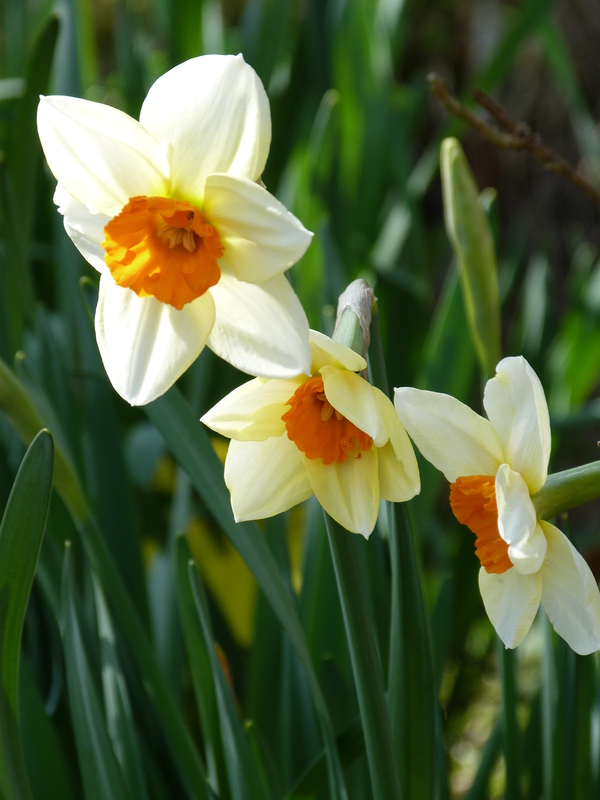 I love gardening, so normally at this time of the year garden plans rapidly start filling up my head, leaving very little room for any other hobbies. This year the first casualty has been sewing. Although I have lots of sewing project ideas, I just don’t seem to find the time for it. Knitting is slightly easier, you can do it outdoors, while enjoying the sunshine, and you can always do a little bit each evening. But in the interest of keeping the sewing theme going while my mind is full of plants and seeds, here are a few more pictures from my archive. 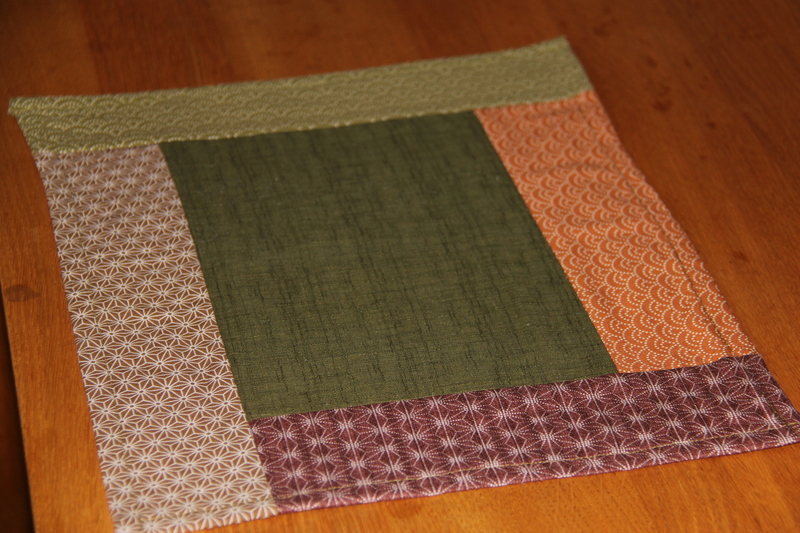 This is a table runner that I made for my little sister Hanna for Christmas. 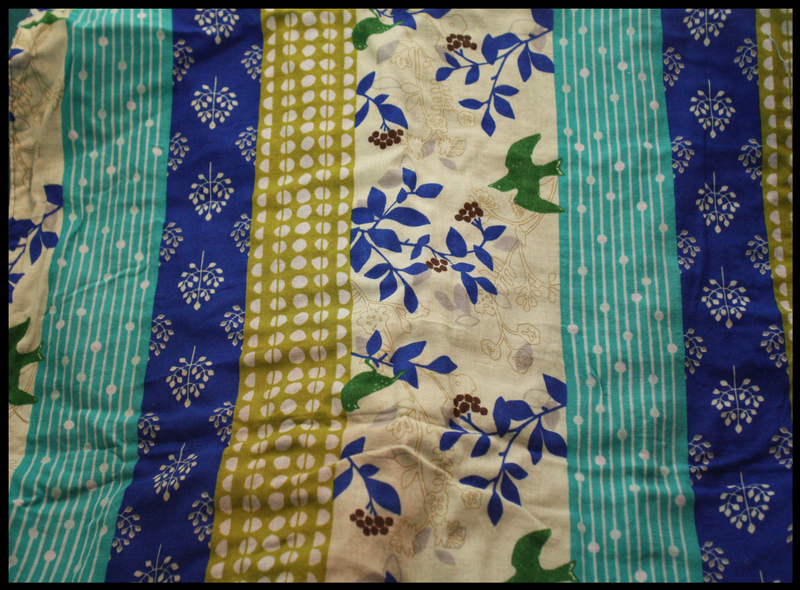 One side is patchwork while the other side is made from a single piece of fabric, despite its patchwork appearance. I particularly like that fabric, I found it on a Japanese online shop and couldn’t resist buying it on several different colourways. 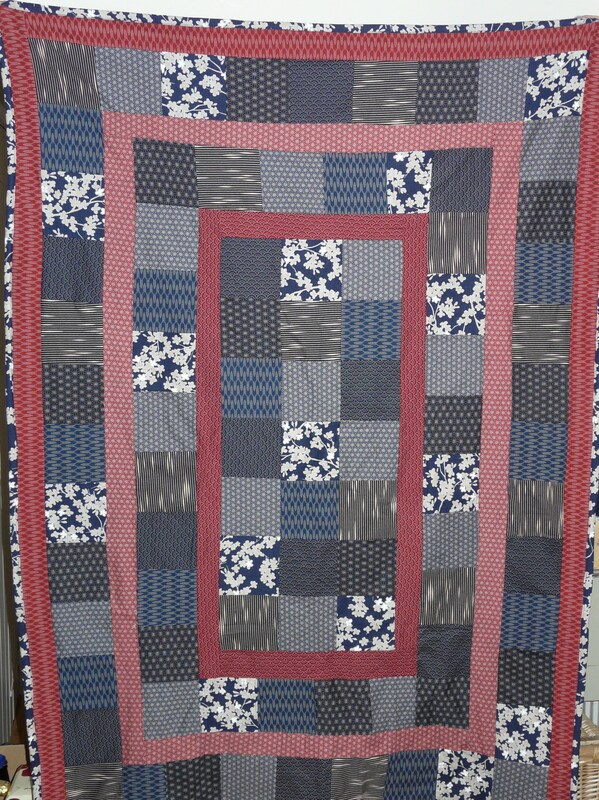 Categories: Tablecloths | Tags: Patchwork; sewing; table runner | Permalink. This week hasn’t been a good week for doing crafts, so here are a couple of pictures from my archive. This is a table cloth I made for my sister-in-law for last Christmas. She specified the kinds of colours she wanted: strong, vibrant ones like magenta, deep pink, turquoise and teal. I then had the pleasure of picking the fabrics. Most of them are flamboyant large scale florals from Philip Jacobs. 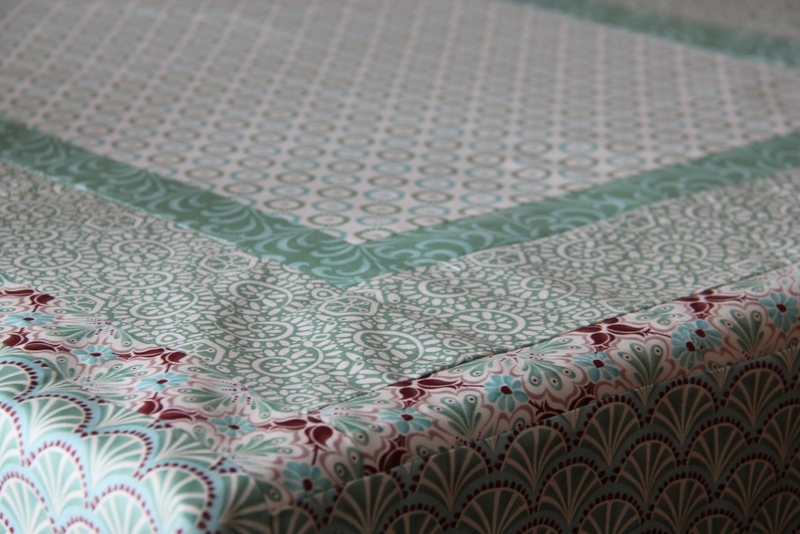 The table cloth is reversible, the other side being mostly turquoise. 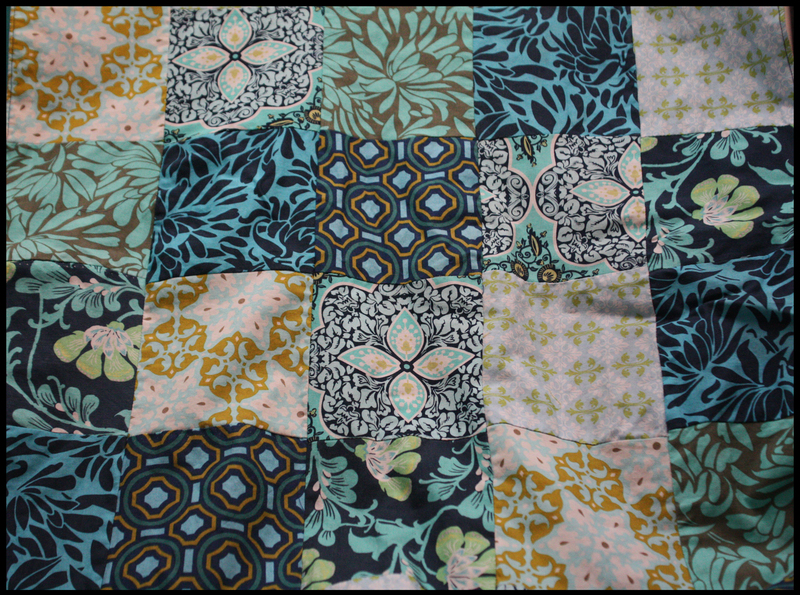 The middle area on the turquoise side is made from one piece (rather than patchwork style), as the fabric was so pretty that I wanted to have a larger are of it. The present was a huge hit as my sister-in-law was really pleased with it. In fact she said it’s nicer than anything you can get in shops, so I was really happy too. Categories: Fabrics, Tablecloths | Tags: patchwork, sewing, tablecloth | Permalink.